The Upstate Women’s Show, a three-day event of shopping, education and entertainment for women, starts at noon today and runs through this Saturday until 7 pm. You can experience fashion shows, cooking demonstrations from popular chefs, speakers on clipping coupons and other money saving ideas. Visit the official Web site for more details on times and admission. In last week’s post about the Upstate Women’s Show, we featured some of Game Day Divas Diva Jewels – the adorable charms you can use to create your own unique Clemson jewelry. Game Day Divas has gotten some great new Diva Jewels in stock, including Dabo Swinney’s saying “All In”. You can also proudly display your crown of “Tailgate Queen” or use the newest mini initial bubbles and create your monogram. They’ve also got a new Tiger bubble charm that has hooks on both sides so you can link it in a bracelet, and I like the fun, 3D glitter boxes in orange and purple. The Game Day Divas have also received a new shipment of flat wallets. The new, thicker style is great if you’re looking to carry more on game days. And the mini-wallet/mobile phone carrying all is perfect for Clemson Girls who want to carry just the basics on game day: your phone, credit cards, license, and cash. 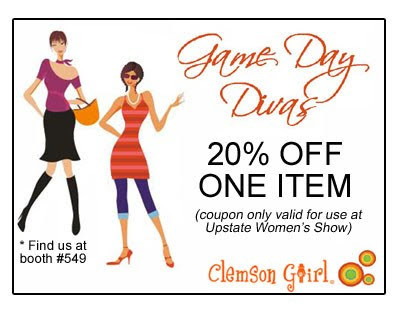 So if you’re in the upstate area, you should definitely make it out for the Upstate Women’s Show – and don’t forget to visit the Game Day Divas (booth #549) and check out some of their great new items! Don’t pass up the opportunity to get 20% off!